If you enjoy entertaining your friends and family in your yard during the summer, you’ll probably be familiar with the menace of mosquitoes. Mosquitoes are not just an annoyance; some species carry an alarming number of potentially fatal diseases. It’s time to take action against these biting pests! Instead of having to douse yourself and your guests with bug repellent spray, you can banish mosquitoes from your yard for good by using a mosquito fogger to treat your whole yard. In this article, we’ll review six of the best mosquito foggers that are currently on the market. 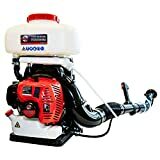 We’ve also included some helpful information on how mosquito foggers work and why a fogger is one the most effective methods of eliminating mozzies from your outdoor space. Before you get into the product review section of our Buyers’ Guide, it’s essential that you know what a mosquito fogger is and how they work. Mosquito foggers spray insecticide into the air in the form of a mist of tiny droplets, hence the term “fogger.” Mosquito foggers come in different sizes; small, handheld models for use in domestic yards and large, backpack foggers for use over extensive areas such as hotel gardens and the like. Mosquito foggers are used outside the home to kill mosquitoes and other bugs that breed in your yard. Mosquito sprays are generally used inside the home to kill mozzies that have found their way indoors. Sprays are not practical for use over large areas such as yards and gardens because they contain only a small volume of insecticide. We’ve picked out a selection of mosquito foggers that receive positive reviews from purchasers. To read the full product spec, check the price, and place your order, simply click the links embedded in the text. Makita is a well-known maker of power tools. Their fogger is a powerful piece of kit that’s designed for use by farmers, groundskeepers, and pest controllers. 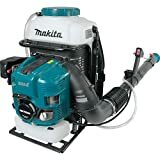 If you have extensive gardens, the Makita mosquito fogger is ideal. This is a powerful, 756cc machine that’s very fuel-efficient. The chemical insecticide is automatically mixed via the intake airflow of the machine to provide uniform concentration in the fog. The engine is quick and easy to start up and operate. The Makita comes with a one year warranty. This is a commercial-grade fogger that’s too big for home use if you have a very small yard. This fogger occupies the highest price point of its class, making it too expensive for many. However, you do get a very high-quality, reliable, and efficient machine for your money. The Tomahawk is a powerful backpack fogger that’s ideal for applying liquid or dust pesticide treatments across large areas. The fogger provides a mist-reach of up to 40 feet. The Tomahawk mosquito fogger uses 1/10th of the amount of liquid pesticide used by other comparable sprayers, making your money go further. The machine is well-designed and easy to operate, so eliminating mozzies in your garden is a quick and straightforward process. Some purchasers have been unimpressed by the quality of this machine, especially for the relatively high price. Buyers have reported problems with the fogger nozzle, which can be difficult to replace if it fails. 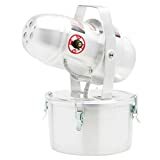 Fountainhead’s propane-powered insect fogger produces an ultra-fine fog that penetrates deep into the dense foliage preferred by mosquitoes, wiping them out quickly and efficiently. The fog is effective for up to six hours. The fog dissipates within five minutes, so you don’t have to wait for ages before you can enjoy your garden again. The insecticide product used with this machine carries no offensive odor and is ready to use, so you don’t have to spend time mixing it. You have to use the prescribed liquid with this fogger. If you try to get away with using a cheaper alternative, the fogger nozzle blocks and the machine won’t work. The Blue Rhino SkeeterVac trap is a good option if you don’t like the idea of flooding your garden with insecticides that could potentially harm other insect life. The unit is straightforward to use and sweeps up other species of insect pests, as well as mozzies. EASY TO USE - Unlike other mosquito trap systems, SkeeterVac's electronic ignition easily sparks the filled propane tank (propane sold separately). The machine’s electronic ignition system sparks the propane tank immediately, so there’s no problem getting the unit to work. The machine is cordless, well-made, and very durable. One tank covers up to one acre of your outdoor space, making this perfect for the average to large-sized family home. Some users have complained that the mosquito trap only caught mozzies on the sticky ring part of the trap, not in the fan/screen trap. This is an insect trap, not an insect killer. If you live in an area where mosquitoes are a big problem, a fogger might be a more effective solution. The Vectorfog C20 is a handheld mosquito fogger that’s designed for home use and is perfect in a small to medium-sized garden. You can use any insecticide that’s designed for use with foggers, so unlike some machines, you’re not tied to using only one expensive brand. Some users have reported a clogging problem with the machine’s nozzle, but that is easily remedied by clearing the blockage with the tip of a paper clip. The Tri Jet ULV is made in the U.S. and is U.L. safety rated. The fogger is suitable for outdoor use only and can be used with water-based, oil-based, or cedar oil-based solutions. The versatility of this unit allows you to fog with both water and oil base materials and may be used either indoors or outdoors. You can use this fogger for mold and mildew control and sanitizer fogging, as well as for insecticide fogging. The easy-to-use unit has an adjustable valve and nozzle, allowing you to mist up to 30 feet in whatever direction you need to. Some users have commented that this unit is only suitable for a small garden or yard, as the machine is not very powerful. Before your new mosquito fogger arrives, there are some safety practices you must be aware of. Mosquito foggers contain toxic insecticides that are designed to kill mosquitoes and other insect pests. These chemicals are also poisonous to people and pets if inhaled. For this reason, you must keep pets and kids indoors during the fogging process and until the mist has dissipated afterward. Always wear a pesticide respirator mask when using the fogger. The Breath Buddy pro quality respirator mask is perfect for this task, and it’s reasonably priced too. If you’re operating the fogger close to your home, be sure to close all windows and doors first so that the mist doesn’t get into your house. Wherever possible, try to avoid using your mosquito fogger on windy days when there’s a danger of the fog blowing into your face or neighboring properties. Use only the insecticides that are approved for use with your chosen make of fogger. Using a cheaper brand could damage the machine. Before using your new mosquito fogger, be sure to read the instruction manual thoroughly. Follow the instructions and don’t take shortcuts! There are two types of mosquito foggers on the market – cold foggers and thermal foggers. Although both types of foggers are effective in controlling mosquito populations in your outside space, each has pros and cons. Thermal foggers are generally cheaper than cold foggers. However, thermal machines do give off a lot of fumes during operation. Also, thermal mosquito foggers are only suitable for outdoor use. That’s because the high temperatures that are necessary to heat the insecticide solution will present a fire hazard if used indoors. Thermal mosquito foggers are powered by electricity or gas. Electric foggers run on electricity so they must be plugged into a mains power supply to work. That means you’re very restricted as you’ll have to trail a power cord around your garden with you while you use the fogger. Gas foggers are powered by propane gas, making them much more portable. The main drawback of gas foggers is that you’ll need to keep replacing or refilling the propane tank. Cold mosquito foggers don’t need a heating assembly to operate. That means the heat generated by the machine isn’t as much of an issue as it is with thermal foggers. Cold foggers utilize air pressure to atomize the fogging solution, rather than heat. Although cold foggers are regarded as safer than thermal foggers, the fog that they create does tend to be invisible, making directing the fog tricky to control and increasing the risk of accidental exposure to the insecticide. Where and when should you use your mosquito fogger? The mosquito foggers we’ve featured in our Guide are only suitable for outdoor use. You can buy aerosol mosquito sprays for indoor use, but you’d need so many cans to be effective, they’re not a practical solution for mozzie control in your yard. Foggers provide an extremely effective, temporary solution for controlling mozzies in your backyard or campsite. Use your fogger before outdoor events and on days when you know you’re going to be spending lots of time outside in your yard. Concentrate on fogging areas of your yard where there is standing water, underneath trees, and in the damp, shady areas mosquitoes love. Try to avoid using the fogger in areas where beneficial, pollinating insects are found such as flower beds and fruit trees, as the insecticide will kill bees and butterflies, as well as undesirables. In the U.S., mosquitoes are most active at dusk, arriving in perfect time to make a meal of your guests! So, you’ll need to get out in your yard with your mosquito fogger at least half an hour before your evening outdoor party starts. In this part of our Buyers’ Guide, we’ll answer some of the most commonly asked questions about mosquito foggers. If you don’t see the information you need, shoot us an email, and we’ll do our best to find an answer to your query! Q: What months are mosquitoes most active? A: Mosquito activity usually begins when the ambient temperature reaches around 50oF. Mosquitoes love hot weather, so as the mercury begins to rise you’ll notice more and more insect activity. Mosquito season is at its peak in the hottest months of the year. Q: What chemicals are used in mosquito foggers? A: The most commonly used insecticide in mosquito foggers is Pyrethrin. This insect killer is derived from natural sources, rather than being synthetic and is used in mozzie control products for a quick knock-down of the pests. Q: Is mosquito fogging safe to do around my pets? A: Although the chemical used in foggers is actually the same as that used in many dog and cat flea treatments, it’s not advisable to allow your pets to be out in the garden while you’re fogging. Always allow at least half an hour before you and your animals go back outside, to allow the fog to disperse entirely. Q: Can I use my mosquito fogger inside my house? A: It’s not advisable to use your mosquito fogger inside your home, especially not if it’s one of the backpack ones. Some of the chemicals used in certain foggers may be oil-based. If you use them inside your home, everything will finish up coated in a slimy, oily residue. Q: How can I kill mosquitoes in my home? To kill mozzies in your home, use a mosquito spray. During mozzie season, fit insect screens over your windows and doors, and keep your lights off at night so as not to attract the insects. If you want to enjoy your garden during mosquito season, it’s a good idea to invest in a mosquito fogger. Of the foggers we featured in this Buyers’ Guide, we particularly liked the Fountainhead’s propane-powered fogger. The machine delivers a super-fine mist that penetrates deep into the vegetation that mozzies love to hide in, so they can’t escape! The fog dissipates quickly, it doesn’t leave behind an unpleasant odor, and the insecticide comes ready mixed. When you buy your mosquito fogger, don’t forget to purchase a pesticide respirator mask too!